"Kandinsky" redirects here. For other uses, see Kandinsky (disambiguation). 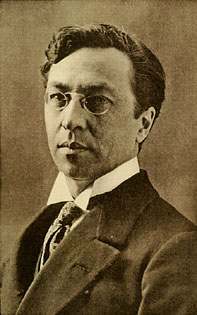 Wassily Wassilyevich Kandinsky (Russian: Васи́лий Васи́льевич Канди́нский, tr. Vasíliy Vasílʹevich Kandínskiy) (16 December [O.S. 4 December] 1866 – 13 December 1944) was a Russian painter and art theorist. Kandinsky is generally credited as the pioneer of abstract art. Born in Moscow, Kandinsky spent his childhood in Odessa, where he graduated at Grekov Odessa Art school. He enrolled at the University of Moscow, studying law and economics. Successful in his profession—he was offered a professorship (chair of Roman Law) at the University of Dorpat—Kandinsky began painting studies (life-drawing, sketching and anatomy) at the age of 30. In 1896, Kandinsky settled in Munich, studying first at Anton Ažbe's private school and then at the Academy of Fine Arts. He returned to Moscow in 1914, after the outbreak of World War I. Following the Russian Revolution, Kandinsky "became an insider in the cultural administration of Anatoly Lunacharsky" and helped establish the Museum of the Culture of Painting. However, by then "his spiritual outlook... was foreign to the argumentative materialism of Soviet society", and opportunities beckoned in Germany, to which he returned in 1920. There he taught at the Bauhaus school of art and architecture from 1922 until the Nazis closed it in 1933. He then moved to France, where he lived for the rest of his life, becoming a French citizen in 1939 and producing some of his most prominent art. He died in Neuilly-sur-Seine in 1944. Kandinsky was born in Moscow, the son of Lidia Ticheeva and Vasily Silvestrovich Kandinsky, a tea merchant. One of his great grandmothers was a Princess Gantimurova, probably explaining the "slight Mongolian trait in his features". Kandinsky learned from a variety of sources while in Moscow. He studied many fields while in school, including law and economics. Later in life, he would recall being fascinated and stimulated by colour as a child. His fascination with colour symbolism and psychology continued as he grew. In 1889, he was part of an ethnographic research group which travelled to the Vologda region north of Moscow. In Looks on the Past, he relates that the houses and churches were decorated with such shimmering colours that upon entering them, he felt that he was moving into a painting. This experience, and his study of the region's folk art (particularly the use of bright colours on a dark background), was reflected in much of his early work. A few years later he first likened painting to composing music in the manner for which he would become noted, writing, "Colour is the keyboard, the eyes are the hammers, the soul is the piano with many strings. The artist is the hand which plays, touching one key or another, to cause vibrations in the soul". Kandinsky was also the uncle of Russian-French philosopher Alexandre Kojève (1902-1968). That it was a haystack the catalogue informed me. I could not recognise it. This non-recognition was painful to me. I considered that the painter had no right to paint indistinctly. I dully felt that the object of the painting was missing. And I noticed with surprise and confusion that the picture not only gripped me, but impressed itself ineradicably on my memory. Painting took on a fairy-tale power and splendour. Kandinsky was similarly influenced during this period by Richard Wagner's Lohengrin which, he felt, pushed the limits of music and melody beyond standard lyricism. He was also spiritually influenced by Madame Blavatsky (1831–1891), the best-known exponent of theosophy. Theosophical theory postulates that creation is a geometrical progression, beginning with a single point. The creative aspect of the form is expressed by a descending series of circles, triangles and squares. Kandinsky's book Concerning the Spiritual In Art (1910) and Point and Line to Plane (1926) echoed this theosophical tenet. Illustrations by John Varley in Thought Forms (1901) influenced him visually. In the summer of 1902, Kandinsky invited Gabriele Münter to join him at his summer painting classes just south of Munich in the Alps. She accepted, and their relationship became more personal than professional. Art school, usually considered difficult, was easy for Kandinsky. It was during this time that he began to emerge as an art theorist as well as a painter. The number of his existing paintings increased in the beginning of the 20th century; much remains of the landscapes and towns he painted, using broad swaths of colour and recognisable forms. For the most part, however, Kandinsky's paintings did not feature any human figures; an exception is Sunday, Old Russia (1904), in which Kandinsky recreates a highly colourful (and fanciful) view of peasants and nobles in front of the walls of a town. Riding Couple (1907) depicts a man on horseback, holding a woman with tenderness and care as they ride past a Russian town with luminous walls across a river. The horse is muted while the leaves in the trees, the town, and the reflections in the river glisten with spots of colour and brightness. This work demonstrates the influence of pointillism in the way the depth of field is collapsed into a flat, luminescent surface. Fauvism is also apparent in these early works. Colours are used to express Kandinsky's experience of subject matter, not to describe objective nature. From 1906 to 1908 Kandinsky spent a great deal of time travelling across Europe (he was an associate of the Blue Rose symbolist group of Moscow), until he settled in the small Bavarian town of Murnau. In 1908 he bought a copy of Thought-Forms by Annie Besant and Charles Webster Leadbeater. In 1909 he joined the Theosophical Society. The Blue Mountain (1908–1909) was painted at this time, demonstrating his trend toward abstraction. A mountain of blue is flanked by two broad trees, one yellow and one red. A procession, with three riders and several others, crosses at the bottom. The faces, clothing, and saddles of the riders are each a single color, and neither they nor the walking figures display any real detail. The flat planes and the contours also are indicative of Fauvist influence. The broad use of color in The Blue Mountain illustrates Kandinsky's inclination toward an art in which color is presented independently of form, and which each color is given equal attention. The composition is more planar; the painting is divided into four sections: the sky, the red tree, the yellow tree and the blue mountain with the three riders. In addition to painting, Kandinsky was an art theorist; his influence on the history of Western art stems perhaps more from his theoretical works than from his paintings. He helped found the Neue Künstlervereinigung München (Munich New Artists' Association), becoming its president in 1909. However, the group could not integrate the radical approach of Kandinsky (and others) with conventional artistic concepts and the group dissolved in late 1911. Kandinsky then formed a new group, the Blue Rider (Der Blaue Reiter) with like-minded artists such as August Macke, Franz Marc, Albert Bloch, and Gabriele Münter. The group released an almanac (The Blue Rider Almanac) and held two exhibits. More of each were planned, but the outbreak of World War I in 1914 ended these plans and sent Kandinsky back to Russia via Switzerland and Sweden. Wassily Kandinsky, Improvisation 27 (Garden of Love II), 1912, oil on canvas, 120.3 x 140.3 cm, Metropolitan Museum of Art, New York. Exhibited at the 1913 Armory Show. Sadleir's interest in Kandinsky also led to Kandinsky's first works entering a British art collection; Sadleir's father, Michael Sadler, acquired several wood-prints and the abstract painting Fragment for Composition VII in 1913 following a visit by father and son to meet Kandinsky in Munich that year. These works were displayed in Leeds, either in the University or the premises of the Leeds Arts Club, between 1913 and 1923. In 1916 he met Nina Andreevskaya (1899-1980), whom he married on February 11, 1917. From 1918 to 1921, Kandinsky was involved in the cultural politics of Russia and collaborated in art education and museum reform. He painted little during this period, but devoted his time to artistic teaching, with a program based on form and colour analysis; he also helped organize the Institute of Artistic Culture in Moscow of which he was the first director. His spiritual, expressionistic view of art was ultimately rejected by the radical members of the Institute as too individualistic and bourgeois. In 1921, Kandinsky was invited to go to Germany to attend the Bauhaus of Weimar by its founder, architect Walter Gropius. The two-metre-wide Yellow – red – blue (1925) of several main forms: a vertical yellow rectangle, an inclined red cross and a large dark blue circle; a multitude of straight (or sinuous) black lines, circular arcs, monochromatic circles and scattered, coloured checker-boards contribute to its delicate complexity. This simple visual identification of forms and the main coloured masses present on the canvas is only a first approach to the inner reality of the work, whose appreciation necessitates deeper observation—not only of forms and colours involved in the painting but their relationship, their absolute and relative positions on the canvas and their harmony. Kandinsky was one of Die Blaue Vier (Blue Four), formed in 1923 with Paul Klee, Lyonel Feininger and Alexej von Jawlensky, which lectured and exhibited in the United States in 1924. Due to right-wing hostility, the Bauhaus left Weimar and settled in Dessau in 1925. Following a Nazi smear campaign the Bauhaus left Dessau in 1932 for Berlin, until its dissolution in July 1933. Kandinsky then left Germany, settling in Paris. Living in an apartment in Paris, Kandinsky created his work in a living-room studio. Biomorphic forms with supple, non-geometric outlines appear in his paintings—forms which suggest microscopic organisms but express the artist's inner life. Kandinsky used original colour compositions, evoking Slavic popular art. He also occasionally mixed sand with paint to give a granular, rustic texture to his paintings. This period corresponds to a synthesis of Kandinsky's previous work in which he used all elements, enriching them. In 1936 and 1939 he painted his final two major compositions, the type of elaborate canvases he had not produced for many years. Composition IX has highly contrasted, powerful diagonals whose central form gives the impression of an embryo in the womb. Small squares of colours and coloured bands stand out against the black background of Composition X as star fragments (or filaments), while enigmatic hieroglyphs with pastel tones cover a large maroon mass which seems to float in the upper-left corner of the canvas. In Kandinsky’s work some characteristics are obvious, while certain touches are more discreet and veiled; they reveal themselves only progressively to those who deepen their connection with his work. He intended his forms (which he subtly harmonised and placed) to resonate with the observer's soul. Fascinated by Christian eschatology and the perception of a coming New Age, a common theme among Kandinsky's first seven Compositions is the apocalypse (the end of the world as we know it). Writing of the "artist as prophet" in his book, Concerning the Spiritual In Art, Kandinsky created paintings in the years immediately preceding World War I showing a coming cataclysm which would alter individual and social reality. Having a devout belief in Orthodox Christianity, Kandinsky drew upon the biblical stories of Noah's Ark, Jonah and the whale, Christ's resurrection, the four horsemen of the Apocalypse in the book of Revelation, Russian folktales and the common mythological experiences of death and rebirth. Never attempting to picture any one of these stories as a narrative, he used their veiled imagery as symbols of the archetypes of death–rebirth and destruction–creation he felt were imminent in the pre-World War I world. As the Der Blaue Reiter Almanac essays and theorising with composer Arnold Schoenberg indicate, Kandinsky also expressed the communion between artist and viewer as being available to both the senses and the mind (synesthesia). Hearing tones and chords as he painted, Kandinsky theorised that (for example), yellow is the colour of middle C on a brassy trumpet; black is the colour of closure, and the end of things; and that combinations of colours produce vibrational frequencies, akin to chords played on a piano. In 1871 the young Kandinsky learned to play the piano and cello. Kandinsky also developed a theory of geometric figures and their relationships—claiming, for example, that the circle is the most peaceful shape and represents the human soul. These theories are explained in Point and Line to Plane (see below). Kandinsky's legendary stage design for a performance of Mussorgsky's "Pictures at an Exhibition" illustrates his synaesthetic concept of a universal correspondence of forms, colors and musical sounds. In 1928 in the theater of Dessau, Wassily Kandinsky realized the stage production of "Pictures at an Exhibition". In 2015 the original designs of the stage elements were animated with modern video technology and synchronized with the music according to the preparatory notes of Kandinsky and the director's script of Felix Klee. Published in Munich in 1911, Kandinsky's text, Über das Geistige in der Kunst, defines three types of painting; impressions, improvisations and compositions. While impressions are based on an external reality that serves as a starting point, improvisations and compositions depict images emergent from the unconscious, though composition is developed from a more formal point of view. Kandinsky compares the spiritual life of humanity to a pyramid—the artist has a mission to lead others to the pinnacle with his work. The point of the pyramid is those few, great artists. It is a spiritual pyramid, advancing and ascending slowly even if it sometimes appears immobile. During decadent periods, the soul sinks to the bottom of the pyramid; humanity searches only for external success, ignoring spiritual forces. The obvious properties we can see when we look at an isolated colour and let it act alone, on one side is the warmth or coldness of the colour tone, and on the other side is the clarity or obscurity of that tone. Warmth is a tendency towards yellow, and coldness a tendency towards blue; yellow and blue form the first great, dynamic contrast. Yellow has an eccentric movement and blue a concentric movement; a yellow surface seems to move closer to us, while a blue surface seems to move away. Yellow is a typically terrestrial colour, whose violence can be painful and aggressive. Blue is a celestial colour, evoking a deep calm. The combination of blue and yellow yields total immobility and calm, which is green. In his writings, published in Munich by Verlag Albert Langen in 1926, Kandinsky analyzed the geometrical elements which make up every painting—the point and the line. He called the physical support and the material surface on which the artist draws or paints the basic plane, or BP. He did not analyze them objectively, but from the point of view of their inner effect on the observer. A line is the product of a force which has been applied in a given direction: the force exerted on the pencil or paintbrush by the artist. The produced linear forms may be of several types: a straight line, which results from a unique force applied in a single direction; an angular line, resulting from the alternation of two forces in different directions, or a curved (or wave-like) line, produced by the effect of two forces acting simultaneously. A plane may be obtained by condensation (from a line rotated around one of its ends). The subjective effect produced by a line depends on its orientation: a horizontal line corresponds with the ground on which man rests and moves; it possesses a dark and cold affective tonality similar to black or blue. A vertical line corresponds with height, and offers no support; it possesses a luminous, warm tonality close to white and yellow. A diagonal possesses a more-or-less warm (or cold) tonality, according to its inclination toward the horizontal or the vertical. The basic plane is, in general, rectangular or square. therefore, it is composed of horizontal and vertical lines which delimit it and define it as an autonomous entity which supports the painting, communicating its affective tonality. This tonality is determined by the relative importance of horizontal and vertical lines: the horizontals giving a calm, cold tonality to the basic plane while the verticals impart a calm, warm tonality. The artist intuits the inner effect of the canvas format and dimensions, which he chooses according to the tonality he wants to give to his work. Kandinsky considered the basic plane a living being, which the artist "fertilises" and feels "breathing". In 2012, Christie's auctioned Kandinsky's Studie für Improvisation 8 (Study for Improvisation 8), a 1909 view of a man wielding a broadsword in a rainbow-hued village, for $23 million. The painting had been on loan to the Kunstmuseum Winterthur, Switzerland, since 1960 and was sold to a European collector by the Volkart Foundation, the charitable arm of the Swiss commodities trading firm Volkart Brothers. Before this sale, the artist's last record was set in 1990 when Sotheby's sold his Fugue (1914) for $20.9 million. On November 16, 2016 Christie's auctioned Kandinsky's Rigide et courbé (rigid and bent), a large 1935 abstract painting, for $23.3 million, a new record for Kandinsky. Solomon R. Guggenheim originally purchased the painting directly from the artist in 1936, but it was not exhibited after 1949, and was then sold at auction to a private collector in 1964 by the Solomon R. Guggenheim Museum. The 1990 play Six Degrees of Separation refers to a "double-sided Kandinsky" painting. No such painting is known to exist; in the 1993 film version of the play, the double-sided painting is portrayed as having Kandinsky's 1913 painting Black Lines on one side and his 1926 painting Several Circles on the other side. The 1999 film Double Jeopardy makes numerous references to Kandinsky, and a piece of his, Sketch, figures prominently in the plot-line. The protagonist, Elizabeth Parsons (Ashley Judd), utilises the registry entry for the work to track down her husband under his new alias. Two variations of the almanac cover of Blue Rider are also featured in the film. In 2014, Google commemorated Kandinsky's 148th birthday by featuring a Google Doodle based on his abstract paintings. A picture-book biography entitled The Noisy Paint Box: The Colors and Sounds of Kandinsky's Abstract Art was published in 2014. Its illustrations by Mary GrandPre earned it a 2015 Caldecott Honor. His grandson was musicology professor and writer Aleksey Ivanovich Kandinsky (1918–2000), whose career was both focused on and centred in Russia. 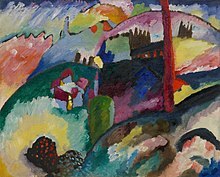 The Solomon R. Guggenheim Museum held a major retrospective of Kandinsky's work from 2009-2010, called Kandinsky. In 2017, a selection of Kandinsky's work was on view at the Guggenheim, Visionaries: Creating a Modern Guggenheim. ^ Voss, Julia (20 May 2013). "The first abstract artist? (And it's not Kandinsky)". Tate Etc. (27). UK: Tate. Retrieved 31 January 2019. ^ Lindsay, Kenneth; Vergo, Peter (1994). Kandinsky: Complete Writings on Art. New York: Da Capo Press. ^ Lindsay, Kenneth and Peter Vergo. "Introduction". Kandinsky: Complete Writings on Art. New York: Da Capo Press, 1994. ^ Liukkonen, Petri. "Wassily Kandinsky". Books and Writers (kirjasto.sci.fi). Finland: Kuusankoski Public Library. Archived from the original on 26 February 2015. ^ Wassily Kandinsky 1866–1944: a Revolution in Painting. Books.google.ca. 2000. ISBN 978-3-8228-5982-7. Retrieved 4 June 2013. ^ Kandinsky, Wassily (1911). Concerning the Spiritual in Art. translated by Michael T. H. Sadler (2004). Kessinger Publishing. p. 32. ISBN 978-1-4191-1377-2. Retrieved 26 December 2012. ^ Düchting, Hajo (2000). Wassily Kandinsky, 1866-1944: A Revolution in Painting. Taschen. p. 94. ISBN 3822859826. ^ Düchting, Hajo (2013). Kandinsky. Taschen. p. 68. ISBN 978-3-8365-3146-7. ^ Rabinovich, Yakov. "Kandinsky: Master of the Mystic Arts". ^ "The Bauhaus Group: Six Masters of Modernism". Columbia College Today. ^ "MONET SELLS FOR $81.4 M., A NEW RECORD, AT $246.3 M. CHRISTIE'S IMP-MOD SALE". ARTnews. 17 November 2016. Retrieved 12 February 2017. ^ a b Pobric, Pac (15 September 2016). "Kandinsky painting bought directly from the artist by Solomon Guggenheim returns to auction". The Art Newspaper. Archived from the original on 12 February 2017. Retrieved 12 February 2017. ^ "FILM; To Fake It Well on the Set, It Pays to Be Genuine". 16 May 1993. ^ "Does a two-sided Kandinsky, like the one shown in the movie actually exist? - Quora". www.quora.com. ^ Wyatt, Daisy. "Wassily Kandinsky's 148th Birthday: Why is the painter is being celebrated in a Google Doodle?". The Independent. Retrieved 16 December 2014. ^ "Google Doodle - Kandinsky's 148th birthday". Google. Retrieved 16 December 2014. ^ "Кандинский Алексей Иванович" (in Russian). Moscow Conservatory. Retrieved 19 November 2015. ^ Smith, Roberta (17 September 2009). "The Angel in the Architecture". The New York Times. ISSN 0362-4331. Retrieved 16 February 2017. ^ "Visionaries: Creating a Modern Guggenheim". Guggenheim. 11 July 2016. Retrieved 16 February 2017. Julian Lloyd Webber, "Seeing red, looking blue, feeling green", The Daily Telegraph 6 July 2006. Wikimedia Commons has media related to Wassily Kandinsky. Video remake of the stage production of "Pictures at an Exhibition" by Kandinsky in 1928 in Dessau, 2015. Wassily Kandinsky papers, 1911–1940. The Getty Research Institute, Los Angeles, California.